In the late 18th century, Charles Messier was busy hunting for comets in the night sky, and noticed several “nebulous” objects. After initially mistaking them for the comets he was seeking, he began to compile a list of these objects so other astronomers would not make the same mistake. Known as the Messier Catalog, this list consists of 100 objects, consisting of distant galaxies, nebulae, and star clusters. Among the many famous objects in this catalog is the M5 globular star cluster (aka. NGC 5904). Located in the galactic halo within the Serpens Constellation, this cluster of stars is almost as old as the Universe itself (13 billion years)! 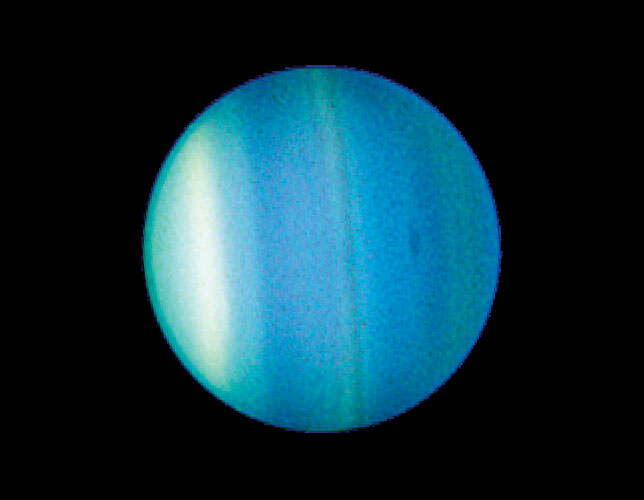 Though very distant from Earth and hard to spot, it is a favorite amongst amateur astronomers who swear by its beauty. Thanks to the Cassini mission, a great many things have been learned about the Saturn system in recent years. In addition to information on Saturn’s atmosphere, rotation and its beautiful and extensive ring system, many revelations have been made about Saturn’s system of moons. For example, very little was known about the obscure moon of Iapetus – sometimes nicknamed Saturn’s “yin-yang” moon – before Cassini‘s arrival. In addition to its mysterious, equatorial ridge, this moon also has a two-tone appearance that has historically made direct observation quite difficult. Due to its distance from Saturn, close-up observation with space probes has also been quite difficult too until very recently. However, what we have learned in the past few years about Iapetus has taught us that it is a world of stark contrasts, and not just in terms of its appearance. Iapetus was discovered by Giovanni Domenico Cassini in April 1671. Along with Rhea, Tethys and Dione, Iapetus was one of four moons Cassini discovered between 1671 and 1672 – which together he named Sidera Lodoicea (“Stars of Louis“, after his patron, Louis XIV). After the discovery, astronomers fell into the habit of referring to them using Roman numerals, with Iapetus being Saturn V.
The name Iapetus was suggested by John Herschel, the son of William Herschel, in his 1847 treatise Results of Astronomical Observations made at the Cape of Good Hope. Like all of Saturn’s moons, the name Iapetus was taken from the Titans of Greek mythology – the sons and daughters of Cronus (the Greek equivalent of the Roman Saturn). Iapetus was the son of Uranus and Gaia and the father of Atlas, Prometheus, Epimetheus and Menoetius. Geological features on Iapetus are named after characters and places from the French epic poem The Song of Roland. Examples of names used include the craters Charlemagne and Baligant, and the northern and southern bright regions, Roncevaux Terra and Sargassio Terra. The one exception is Cassini Regio the dark region of Iapetus, named after the region’s discoverer, Giovanni Cassini. With a mean radius of 734.5 ± 2.8 km and a mass of about 1.806 × 1021 kg, Iapetus is 0.1155 times the size of Earth and 0.00030 times as massive. It orbits its parent planet at an average distance (semi major axis) of 3,560,820 km. With a noticeable eccentricity of 0.0286125, its orbit ranges in distance from 3,458,936 km at periapsis and 3,662,704 km at apoapsis. With an average orbital speed of 3.26 km/s, Iapetus takes 79.32 days to complete an single orbit of Saturn. Despite being Saturn’s third-largest moon, Iapetus orbits much farther from Saturn than its next closest major satellite (Titan). It has also the most inclined orbital plane of any of the regular satellites – 17.28° to the ecliptic, 15.47° to Saturn’s equator, and 8.13° to the Laplace plane. Only the irregular outer satellites like Phoebe have more inclined orbits. 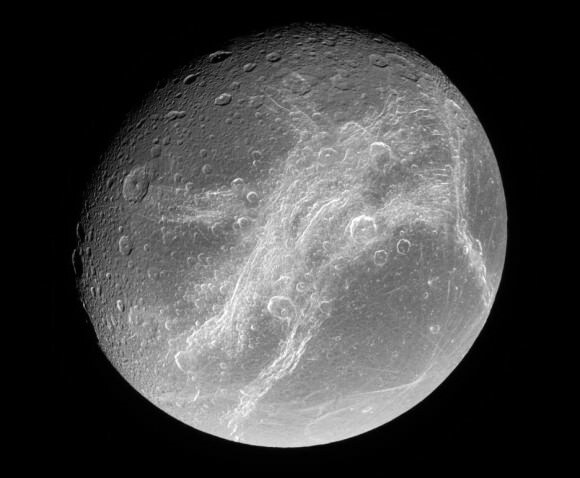 Like many of Saturn’s moons – particularly Tethys, Mimas and Rhea – Iapetus has a low density (1.088 ± 0.013 g/cm³) which indicates that it is composed primary of water ice and only about 20% rock. But unlike most of Saturn’s larger moons, its overall shape is neither spherical or ellipsoid, instead consisting of flattened poles and a bulging waistline. Its large and unusually high equatorial ridge (see below) also contributes to its disproportionate shape. Because of this, Iapetus is the largest known moon to not have achieved hydrostatic equilibrium. Though rounded in appearance, its bulging appearance disqualifies it from being classified as spherical. As is common with Cronian moons, Iapetus’ surface shows considerable signs of cratering. Recent images taken by the Cassini spacecraft have revealed multiple large impact basins, with at least five measuring over 350 km in diameter. The largest, Turgis, has a diameter of 580 km, with an extremely steep rim and a scarp about 15 km in height. It has also been concluded that Iapetus’ surface supports long-runout landslides (aka. sturzstroms), which could be due to ice sliding. As already noted, another interesting feature on Iapetus is its famous equatorial ridge, which measures 1300 km in length, 20 km wide, 13 km high, and runs along the center of the Cassini Regio dark region. Though indications had been made as to the existence of a mountain chain in this region earlier, the ridge was observed directly for the first time when the Cassini spacecraft took its first images of Iapetus on December 31st, 2004. But perhaps Iapetus’ best known feature is its two-tone coloration. This was first observed by Giovanni Cassini in the 17th century, who noted that he could only view Iapetus when it was on the west side of Saturn and never on the east. At the time, he correctly concluded that Iapetus was tidally-locked with Saturn, and that one side was darker than the other. This conclusion was later backed up by observations using ground-based telescopes. The dark region is named Cassini Regio, and the bright region is divided into Roncevaux Terra – which lies north of the equator – and Saragossa Terra, which is south of it. Today, it is understood that dark regions are carbonaceous, and likely contain organic compounds similar to the substances found in primitive meteorites or on the surfaces of comets – i.e. frozen cyano-compounds like hydrogen cyanide polymers. The pattern of coloration is analogous to a spherical yin-yang symbol, hence the nickname “Saturn’s yin-yang moon.” The difference in coloration between the two Iapetian hemispheres is quite extreme. While the leading hemisphere is dark, with an albedo of 0.03–0.05 (and has a slight reddish-brown coloring), most of the trailing hemisphere and poles are almost as bright as Europa (albedo 0.5–0.6). Thus, the apparent magnitude of the trailing hemisphere is around 10.2, whereas that of the leading hemisphere is around 11.9. Theories as to its cause generally agree that the original dark material must have come from outside Iapetus, but that subsequent darkening is caused by the sublimation of ice from the warmer areas of Iapetus’s surface, causing volatile compounds to sublimate out and retreat to colder regions. Because of its slow rotation of 79 days, Iapetus experiences enough of a temperature difference to facilitate this. Near the equator, heat absorption by the dark material results in a daytime temperatures in Cassini Regio of 129 K (-144.15 °C/-227.5 °F) compared to 113 K (-160.15 °C/-256.3 °F) in the bright regions. The difference in temperature means that ice sublimates from Cassini Regio, then deposits in the colder bright areas and especially at the even colder poles. Over geologic time scales, this would further darken Cassini Regio and brighten the rest of Iapetus, creating a runaway thermal feedback process of ever greater contrast in albedo, ending with all exposed ice being lost from Cassini Regio. This model is the generally accepted one because it explains the distribution of light and dark areas, the absence of shades of grey, and the thinness of the dark material covering Cassini Regio. However, it is acknowledged that a separate process would be required to get this process thermal feedback started. It is therefore theorized that initially, dark material came from elsewhere, most likely some of Saturn’s small, retrograde moons. Material from these moons could have been blasted off either by micrometeoroids or a large impact. This material would then have been darkened from exposure to sunlight, then swept up by the leading hemisphere of Iapetus. Once this process created a modest contrast in albedo (and hence, temperature) on Iapetus’ surface, the thermal feedback process would have come into play and exaggerated it further. The greatest source of this material is believed to be Phoebe, the largest of Saturn’s outer moons. The discovery of a tenuous disk of material in the plane of (and just inside of) Phoebe’s orbit, which was announced on October 6th, 2009, supports this theory. The first robotic spacecraft to explore Iapetus were the Voyager 1 and Voyager 2 probes, which passed through the Saturn system on their way to the outer Solar System in 1980 and 1981. Data from these missions provided scientists with the first indications of Iapetus’ mountains, which were thereafter informally referred to as the “Voyager Mountains”. Saturn’s moon Iapetus, captured by the Cassini space probe on New Year’s Eve 2004. Credit: NASA/JPL/Space Science Institute. Only the Cassini orbiter has ever explored Saturn’s moon of Iapetus, which captured multiple images of the moon from moderate distances since 2004. For instance, on New Year’s Eve 2004, Cassini passed Iapetus at a distance of 122,647 kilometers (76,209 miles) and captured the four visible light images that were put together to form the view of its equatorial ridge jutting out to the side (shown above). However, its great distance from Saturn makes close observation difficult. As a result, Cassini made only one targeted close flyby, which took place on September 10th, 2007 at a minimum range of 1227 km. It was during this flyby that data was obtained which indicated that thermal segregation is likely the primary force responsible for Iapetus’ dark hemisphere. No future missions are planned at this time. Iapetus is a world of contrasts, and not just in terms of its color. In addition, it is a very small moon that still managed to be massive enough to achieve hydrostatic equilibrium. And despite being one of Saturn’s larger moons, it orbits at a distance usually reserved for smaller, irregular moons. Coupled with the fact that scientists are still not sure why it has its unusual walnut-shape, Iapetus is likely to be a target for any research missions headed to study the Cronian moons in the coming years. We have many great articles on Iapetus and Saturn’s moons here at Universe Today. Here is one about its famous ridge, its two-tone coloring, the ice avalanches it periodically experiences, and whether or not it consumed one of Saturn’s rings. For more information, check out NASA’s View of the Solar System page on Iapetus, and the Cassini Solstice Mission’s page. Much has been learned about Saturn’s system of moons in recent decades, thanks to the Voyager missions and the more recent surveys conducted by the Cassini spaceprobe. Between its estimated 150 moons and moonlets (only 53 of which have been identified and named) there is no shortage of scientific curiosities, and enough mysteries to keep astronomers here on Earth busy for decades. Consider Mimas, which is often referred to as Saturn’s “Death Star Moon” on a count of its unusual appearance. Much like Saturn’s moons Tethys and Rhea, Mimas’ peculiar characteristics represents something of a mystery. Not only is it almost entirely composed ice, it’s coloration and surface features reveal a great deal about the history of the Saturnian (aka. Cronian) system. On top of that, it may even house an interior, liquid-water ocean. Saturn’s moon Mimas was discovered by William Herschel in 1789, more than 100 years after Saturn’s larger moons were discovered by Christian Huygens and Giovanni Cassini. As with all the seven then-known satellites of Saturn, Mimas’ name was suggested by William Herschel’s son John in his 1847 publication Results of Astronomical Observations made at the Cape of Good Hope. Mimas takes its name from one of the Titans of Greek mythology, who were the sons and daughters of Cronus (the Greek equivalent to Jupiter). Mimas was an offspring of Gaia, born from the blood of the castrated Uranus, who eventually died during the struggle with the Olympian Gods for control of the universe. With a mean radius of 198.2 ± 0.4 km and a mass of about 3.75 ×1019 kg, Mimas is equivalent in size to 0.0311 Earths and 0.0000063 times as massive. Orbiting Saturn at an average distance (semi-major axis) of 185,539 km, it is the innermost of Saturn’s larger moons, and the 8th moon orbiting Saturn. It’s orbit also has a minor eccentricity of 0.0196, ranging from 181,902 km at periapsis and 189,176 km at apoapsis. With an estimated orbital velocity of 14.28 km/s, Mimas takes 0.942 days to complete a single orbit of Saturn. Like many of Saturn’s moons. Mimas rotation period is synchronous to its orbital period, which means it keeps one face constantly pointing towards the planet. Mimas is also in a 2:1 mean-motion resonance with the larger moon Tethys, and in a 2:3 resonance with the outer F Ring shepherd moonlet, Pandora. Mimas’ mean density of 1.1479 ± 0.007 g/cm³ is just slightly higher than that of water (1 g/cm³), which means that Mimas is mostly composed of water ice, with just a small amount of silicate rock. In this respect, Mimas is much like Tethys, Rhea, and Dione – moon’s of Saturn that are primarily composed of water ice. Due to the tidal forces acting on it, Mimas is noticeably prolate – i.e. its longest axis is about 10% longer than the shortest, giving it its egg-shaped appearance. In fact, with a diameter of 396 km (246 mi), Mimas is just barely large and massive enough to achieve hydrostatic equilibrium (i.e. to become rounded in shape under the force of its own gravitation). Mimas is the smallest known astronomical body to have achieved this. Three types of geological features are officially recognized on Mimas: craters, chasmata (chasms) and catenae (crater chains). Of these, craters are the most common, and it is believed that many of them have existed since the beginning of the Solar System. Mimas surface is saturated with craters, with every part of the surface showing visible depressions, and newer impacts overwriting older ones. Mimas’ most distinctive feature is the giant impact crater Herschel, named in honor of William Herschel (the discoverer of Uranus, its moons Oberon, and Titania, and the Cronian moons Enceladus and Mimas). This large crater gives Mimas the appearance of the “Death Star” from Star Wars. At 130 km (81 mi) in diameter, Herschel’s is almost a third of Mimas’ own diameter. Its walls are approximately 5 km (3.1 mi) high, parts of its floor measure 10 km (6.2 mi) deep, and its central peak rises 6 km (3.7 mi) above the crater floor. If there were a crater of an equivalent scale on Earth, it would be over 4,000 km (2,500 mi) in diameter, which would make it wider than the continent of Australia. The impact that made this crater must have nearly shattered Mimas, and is believed to have created the fractures on the opposite side of the moon by sending shock waves through Mimas’s body. In this respect, Mimas’ surface closely resembles that of Tethys, with its massive Odysseus crater on its western hemisphere and the concentric Ithaca chasma, which is believed to have formed as a result of the impact that created Odysseus. Mimas’ surface is also saturated with smaller impact craters, but no others are anywhere near the size of Herschel. The cratering is also not uniform, with most of the surface being covered with craters larger than 40 km (25 mi) in diameter. However, in the south polar region, there are generally no craters larger than 20 km (12 mi) in diameter. Data obtained in 2014 from the Cassini spacecraft has also led to speculation about a possible interior ocean. Due to the planet’s libration (oscillation in its orbit), scientists believe that the planet’s interior is not uniform, which could be the result of a rocky interior or an interior ocean at the core-mantle boundary. This ocean would likely be maintained thanks to tidal flexing caused by Mimas’ orbital resonances with Tethys and Pandora. A number of features in Saturn’s rings are also related to resonances with Mimas. Mimas is responsible for clearing the material from the Cassini Division, which is the gap between Saturn’s two widest rings – the A Ring and B Ring. The repeated pulls by Mimas on the Cassini Division particles, always in the same direction, forces them into new orbits outside the gap. Particles in the Huygens Gap at the inner edge of the Cassini division are in a 2:1 resonance with Mimas. In other words, they orbit Saturn twice for each orbit competed by Mimas. The boundary between the C and B ring is meanwhile in a 3:1 resonance with Mimas; and recently, the G Ring was found to be in a 7:6 co-rotation eccentricity resonance with Mimas. The first mission to study Mimas up close was Pioneer 11, which flew by Saturn in 1979 and made its closest approach on Sept. 1st, 1979, at a distance of 104,263 km. The Voyager 1 and 2 missions both flew by Mimas in 1980 and 1981, respectively, and snapped pictures of Saturn’s atmosphere, its rings, its system of moons. Images taken by Voyager 1 probe were the first ever of the Herschel crater. Mimas has been imaged several times by the Cassini orbiter, which entered into orbit around Saturn in 2004. A close flyby occurred on February 13, 2010, when Cassini passed Mimas at a distance of 9,500 km (5,900 mi). In addition to providing multiple images of Mimas’ cratered surface, it also took measurements of Mimas’ orbit, which led to speculation about a possible interior ocean. The Saturn system is truly a wonder. So many moons, so many mysteries, and so many chances to learn about the formation of the Solar System and how it came to be. One can only hope that future missions are able to probe some of the deeper ones, like what might be lurking beneath Mimas’ icy, imposing “Death Star” surface! We’ve written many great articles about Mimas and Saturn’s moons here at Universe Today. Here’s one about the Herschel Crater, one about the first detailed look Cassini made, and one about it’s “Death Star” appearance. Another great resource about Mimas is Solar Views, and you can get even more info from the Nine Planets. The Asteroid Belt is a pretty interesting place. In addition to containing between 2.8 and 3.2 quintillion metric tons of matter, the region is also home to many minor planets. The largest of these, known as Ceres, is not only the largest minor planet in the Inner Solar System, but also the only body in this region to be designated as a “dwarf planet” by the International Astronomical Union (IAU). Due to its size and shape, when it was first observed, Ceres was thought to be a planet. While this belief has since been revised, Ceres is alone amongst objects in the Asteroid Belt in that it is the only object massive enough to have become spherical in shape. And like most of the dwarf planets in our Solar System, its status remains controversial, and our knowledge of it limited. 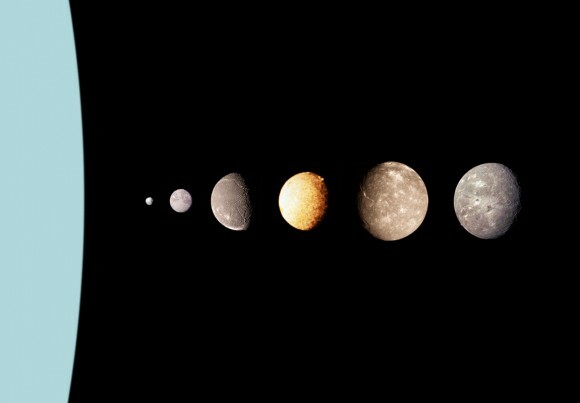 Ceres was discovered by Giuseppe Piazzi on January 1st, 1801, while searching for zodiacal stars. However, the existence of Ceres had been predicted decades before by Johann Elert Bode, a German astronomer who speculated that there had to be a planet between Mars and Jupiter. The basis for this assumption was the now defunct Bode-Titus law, which was first proposed by Johann Daniel Titius in 1766. This law stated that there existed a regular pattern in the semi-major axes of the orbits of known planets, the only exception of which was the large gap between Mars and Jupiter. In an attempt to resolve this, in 1800, German astronomer Franz Xaver von Zach sent requests to twenty-four experienced astronomers (dubbed the “Celestial Police”) to combine their their efforts to located this missing planet. One of these astronomers was Giuseppe Piazzi at the Academy of Palermo, who had made the discovery shortly before his invitation to join the group had arrived. At the time of his discovery, he mistook it for a comet, but subsequent observations led him to declare that it could be something more. He officially shared his observations with friends and colleagues by April of 1801, and sent the information to von Zach to be published in September. Unfortunately, due to its change in its apparent position, Ceres was too close to the Sun’s glare to be visible to astronomers. It would not be until the end of the year that it would be spotted again, thanks in large part to German astronomer Carl Freidrich Gauss and the predictions he made of its orbit. On December 31st, von Zach and his colleague Heinrich W.M. Olbers found Ceres near the position predicted by Gauss, and thus recovered it. Piazzi originally suggesting naming his discovery Cerere Ferdinandea, after the Roman goddess of agriculture Ceres (Cerere in Italian) and King Ferdinand of Sicily. The name Ferdinand was dropped in other nations, but Ceres was eventually retained. Ceres was also called Hera for a short time in Germany; whereas in Greece, it is still called Demeter after the Greek equivalent of the Roman goddess Ceres. The classification of Ceres has changed more than once since its discovery, and remains the subject of controversy. For example, Johann Elert Bode – a contemporary of Piazzi – believed Ceres to be the “missing planet” he had proposed to exist between Mars and Jupiter. Ceres was assigned a planetary symbol, and remained listed as a planet in astronomy books and tables (along with 2 Pallas, 3 Juno, and 4 Vesta) until the mid-19th century. Ceres compared to asteroids visited to date, including Vesta, Dawn’s mapping target in 2011. Credit: NASA/ESA/Paul Schenck. As other objects were discovered in the neighborhood of Ceres, it was realized that Ceres represented the first of a new class of objects. In 1802, with the discovery of 2 Pallas, William Herschel coined the term asteroid (“star-like”) for these bodies. As the first such body to be discovered, Ceres was given the designation 1 Ceres under the modern system of minor-planet designations. By the 1860s, the existence of a fundamental difference between asteroids such as Ceres and the major planets was widely accepted, though a precise definition of “planet” was never formulated. The 2006 debate surrounding Eris, Pluto, and what constitutes a planet led to Ceres being considered for reclassification as a planet. The definition that was adopted on August 24th, 2006 carried the requirements that a planet have sufficient mass to assume hydrostatic equilibrium, be in orbit around a star and not be a satellite, and have cleared the neighborhood around its orbit. As it is, Ceres does not dominate its orbit, but shares it with the thousands of other asteroids, and constitutes only about a third of the mass of the Asteroid Belt. Bodies like Ceres that met some of these qualification, but not all, were instead classified as “dwarf planets”. In addition to the controversy surrounding the use of this term, there is also the question of whether or not Ceres status as a dwarf planet means that it can no longer be considered an asteroid. The 2006 IAU decision never addressed whether Ceres is an asteroid or not. In fact, the IAU has never defined the word ‘asteroid’ at all, having preferred the term ‘minor planet’ until 2006, and the terms ‘small Solar System body’ and ‘dwarf planet’ thereafter. Early observations of Ceres were only able to calculate its size to within an order of magnitude. In 1802, English astronomer William Herschel underestimated its diameter as 260 km, whereas in 1811 Johann Hieronymus Schröter overestimated it as 2,613 km. Current estimates place its mean radius at 473 km, and its mass at roughly 9.39 × 1020 kg (the equivalent of 0.00015 Earths or 0.0128 Moons). With this mass, Ceres comprises approximately a third of the estimated total mass of the asteroid belt (which is in turn approximately 4% of the mass of the Moon). The next largest objects are Vesta, Pallas and Hygiea, which have mean diameters of more than 400 km and masses of 2.6 x 1020 kg, 2.11 x 1020 kg, and 8.6 ×1019 kg respectively. The mass of Ceres is large enough to give it a nearly spherical shape, which makes it unique amongst objects and minor planets in the Asteroid Belt. Ceres follows a slightly inclined and moderately eccentric orbit, ranging from 2.5577 AU (382.6 million km) from the Sun at perihelion and 2.9773 AU (445.4 million km) at aphelion. It has an orbital period of 1,680 Earth days (4.6 years) and takes 0.3781 Earth days (9 hours and 4 minutes) to complete a sidereal rotation. Based on its size and density (2.16 g/cm³), Ceres is believed to be differentiated between a rocky core and an icy mantle. Based on evidence provided by the Keck telescope in 2002, the mantle is estimated to be 100 km-thick, and contains up to 200 million cubic km of water – which is more fresh water than exists on Earth. Infrared data on the surface also suggests that Ceres may have an ocean beneath its icy mantle. If true, it is possible that this ocean could harbor microbial extraterrestrial life, similar to what has been proposed about Mars, Titan, Europa and Enceladus. It has further been hypothesized that ejecta from Ceres could have sent microbes to Earth in the past. Other possible surface constituents include iron-rich clay minerals (cronstedtite) and carbonate minerals (dolomite and siderite), which are common minerals in carbonaceous chondrite meteorites. The surface of Ceres is relatively warm, with the maximum temperature estimated to reach approximately 235 K (-38 °C, -36 °F) when the Sun is overhead. Assuming the presence of sufficient antifreeze (such as ammonia), the water ice would become unstable at this temperature. Therefore, it is possible that Ceres may have a tenuous atmosphere caused by outgassing from water ice on the surface. The detection of significant amounts of hydroxide ions near Ceres’ north pole, which is a product of water vapor dissociation by ultraviolet solar radiation, is another indication of this. However, it was not until early 2014 that several localized mid-latitude sources of water vapor were detected on Ceres. Possible mechanisms for the vapor release include sublimation from exposed surface ice (as with comets), cryovolcanic eruptions resulting from internal heat, and subsurface pressurization. The limited amount of data suggests that the vaporization is more consistent with cometary-style sublimation. Multiple theories exist as to the origin of Ceres. On the one hand, it is widely believed that Ceres is a surviving protoplanet which formed 4.57 billion year ago in the Asteroid Belt. Unlike other inner Solar System protoplanets, Ceres neither merged with others to form a terrestrial planet and avoided being ejected from the Solar System by Jupiter. However, there is an alternate theory that proposes that Ceres formed in the Kuiper belt and later migrated to the asteroid belt. The geological evolution of Ceres is dependent on the heat sources that were available during and after its formation, which would have been provided by friction from planetesimal accretion and decay of various radionuclides. These are thought to have been sufficient to allow Ceres to differentiate into a rocky core and icy mantle soon after its formation. This icy surface would have gradually sublimated, leaving behind various hydrated minerals like clay minerals and carbonates. Today, Ceres appears to be a geologically inactive body, with a surface sculpted only by impacts. The presence of significant amounts of water ice in its composition is what has led scientists to the possible conclusion that Ceres has or had a layer of liquid water in its interior. Until recently, very few direct observations had been made of Ceres and little was known about its surface features. In 1995, the Hubble Space Telescope captured high-resolutions images that showed a dark spot in the surface that was thought to be a crater – and nicknamed “Piazzi” after its founder. The near-infrared images taken by the Keck telescope in 2002 showed several bright and dark features moving with Ceres’s rotation. Two of the dark features had circular shapes and were presumed to be craters. One was identified as the “Piazzi” feature, while the other was observed to have a bright central region. 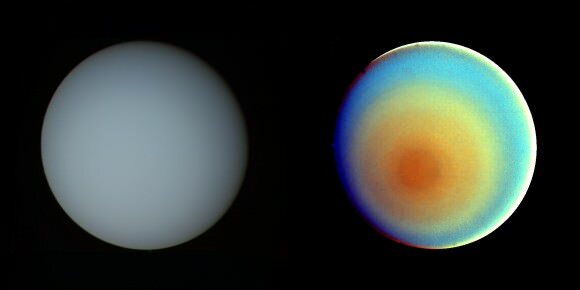 In 2003 and 2004, visible-light images were taken by Hubble during a full rotation that showed 11 recognizable surface features, the natures of which are yet undetermined. With the launch of the Dawn mission, with which NASA intends to conduct a nearly decade-long study of Ceres and Vesta, much more has been learned about this dwarf planet. For instance, after achieving orbit around the asteroid in March of 2015, Dawn revealed a large number of surface craters with low relief, indicating that they mark a relatively soft surface, most likely made of water ice. Several bright spots have also been observed by Dawn, the brightest of which (“Spot 5”) is located in the middle of an 80 km (50 mi) crater called Occator. These bright features have an albedo of approximately 40% that are caused by a substance on the surface, possibly ice or salts, reflecting sunlight. A haze periodically appears above Spot 5, supporting the hypothesis that some sort of outgassing or sublimating ice formed the bright spots. The Dawn spacecraft also noted the presence of a towering 6 kilometer-tall mountain (4 miles or 20,000 feet) in early August, 2015. This mountain, which is roughly pyramidal in shape and protrudes above otherwise smooth terrain, appears to be the only mountain of its kind on Ceres. Like so many celestial bodies in our Solar System, Ceres is a mystery that scientists and astronomers are working to slowly unravel. In time, our exploration of this world will likely teach us much about the history and evolution of our Solar System, and may even lead to the discovery of life beyond Earth. We have many interesting articles on Ceres here at Universe Today. For example, here are some articles on the many bright spots captured by the Dawn probe, and what they likely are. And here are some articles on the Asteroid Belt and Why it Isn’t a Planet. For more information, check out NASA’s Dawn – Ceres and Vesta and Dwarf Planets: Overview.